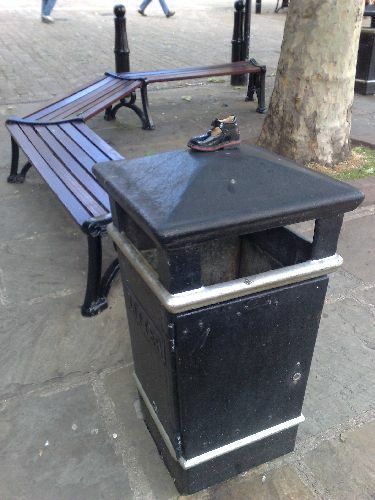 >Surrounding the marketplace of this busy market town, are benches and trees, and bins dotted around for convenience. Situated outside one particular chemist I saw this beauty, framed by the bench, the tree and the formal bin beneath. What poor child has to greet it’s grandparent with only one shoe perhaps? Or what relief might the child feel if this particular shoe was pinchy, not favoured. I’m willing to bet this one wasn’t cheap to replace, either. >~laughs~ quite so mum, mad isn’t it? !